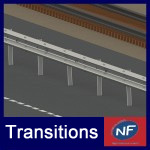 Barriers for bridges, known as parapets, ensure the protection of users on bridges and viaducts. They are installed in continuity with the road restraint systems using dedicated connections. 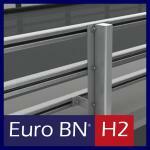 ROADIS LPC range includes two Bridge Parapets Euro BN H2 and Euro BN H3. Both of them can be installed using either mechanical or chemical fixing. A version equipped with mesh is also available allowing both systems to be also considered as pedestrian parapets. 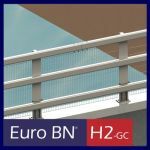 The Euro BN H2 and H3 devices are efficient systems with reduce working width (Wm), dynamic deflection (Dm) and vehicle intrusion (VIM). ROADIS LPC offers turnkey solutions including supply and installation of bridge parapets.